Mai Thai Restaurant uses their own specialised couriers to deliver their food. Deep fried tofu served with sweet chilli sauce and crushed peanut. Minced chicken, potatoes, carrots, green peas, corn and curry powder. Deep fried spring roll skin wrapped with vegetables and clear noodles served with sweet chilli sauce. Minced chicken and prawn with carrot, water chestnut, corn, taro and vermicelli served with sweet chilli sauce. Deep fried fish patty mixed with herbs and red chilli paste served with sweet chilli sauce. Thai toast topped with marinated chicken and exotic herbs with sweet chilli sauce. Char-grilled chicken fillet served with thick peanut sauce. Marinated chicken wing stuffed with chicken mince, vermicelli noodles and herbs served with sweet chilli sauce. Deep fried prawns wrapped in spring roll skins and vegetables served with sweet sauce. One piece of spring roll, dumpling, fish cake and chicken curry puff served with sweet chilli sauce. A famous green curry. The traditional Thai curry with green curry paste made from chilli blended with coconut milk and vegetables. A smooth curry with red chilli paste made from chilli powder with coconut milk and vegetables. Hot and spicy Thai country style red curry (without coconut milk) with green beans, bamboo, and herbs (medium or hot) and your choice of meat. Stir fried meat of your choice with red curry paste, coconut milk, bamboo shoot and runner beans. An innovative chicken curry combining the taste and aroma of yellow curry cooked in coconut milk and potatoes. Thai style peanut curry. A thick red curry with coconut milk, crushed roasted peanuts, and kaffir lime leaves and your choice of meat. Tender chunky pieces of chicken cooked with bamboo shoot in coconut milk. This tasty curry of stewed beef cooked with potatoes and peanuts. Thick red curry and coconut cream sauce with kaffir lime leaves. Stir fried meat of your choice with mild chilli shrimp paste, cashew nut, onion and roasted whole chilli (optional). Stir fried meat of your choice with a drop of whisky, Thai style chilli, lemon grass, green pepper corn, mushrooms, basil leaves and vegetables. Stir-fried meat of your choice with Thai style chilli, garlic, onion, bamboo shoot, basil leaves, runner beans and mushroom. Stir fried meat of your choice with red chilli paste, kaffir lime leaves and runner beans. Stir fried meat of your choice with chilli paste, green pepper corn, kaffir lime leaves, basil and milk. Stir fried meat of your choice hot and spicy with kachai striped, green pepper corn, kaffir lime leaves, chilli and vegetables. Stir fried hot and spicy lightly battered chicken with fresh chilli, kaffir lime leaves and basil leaves. Stir fried squid with chilli jam, carrot, snow peas and mushrooms. Stir fried selection with oyster sauce, broccoli, carrot, onion and mushrooms. Stir fried selection with freshly striped ginger and mushrooms. Stir fried selection with tomatoes, onion, pineapple, vegetable, sweet and sour sauce. Stir fried meat of your choice with fresh asparagus and mushroom (available in the season). Stir fried meat of your choice with mixed vegetables, garlic and oyster sauce. Stir fried meat of your choice with garlic, coriander and pepper. Thai style fried rice with chilli, eggs and basil with meat of your choice. Thai style fried rice with egg, onion and peas with meat of your choice. Thai style fried rice with pineapple, curry powder, egg and cashew nuts. Stir fried flat rice noodles with egg, bean sprouts, tofu and chives tossed in tamarind sauce, garnished with roasted crushed peanuts. Stir fried vermicelli noodles with egg and bean sprouts. Stir fried flat rice noodles with egg, vegetables and sweet dark soy sauce. (Pad Khee Mao Noodles) Stir fried flat rice noodles with chilli, basil and vegetables. Stir fried egg noodles with cashew nuts, sweet chilli sauce, bean sprouts and carrot. Grilled marinated chicken breast served with sweet chilli sauce. Deep fried fish topped with sweet and spicy tamarind chilli sauce. Deep fried fish topped with hot and spicy chilli sauce and kaffir lime leaves. Steamed fish topped with ginger and plum sauce. Steamed mixed seafood in coconut milk with red curry paste, eggs, limes and vegetable. Stir fried prawns with cashew nuts, Thai style sweet and spicy tamarind chilli sauce. Deep fried lightly battered prawns served with spicy chilli sauce. Crispy lightly battered prawns served with spicy tamarind sauce. Spicy salad made of your choice with red onion, coriander, lemongrass, toasted ground rice, fish sauce, lemon juice and chilli powder served with fresh lettuce. (Som Tum) Shredded raw papaya mixed with sliced tomatoes, carrot, green beans, garlic, crushed peanuts, fish sauce, lemon juice, palm sugar and chilli (seasonal). Steamed vegetable topping with white sesame seeds and homemade peanut sauce (satay sauce). Fresh salad with tofu, boiled egg, fish sauce, lemon juice, crushed peanuts and chilli or served with peanut sauce. Crispy fish fillets tossed with green apple in Thai salad dressing garnished with roasted cashew nuts and lettuce. Thin slices of grilled beef salad mixed with red onion, chilli, cucumber, coriander, tomatoes, fish sauce and lemon juice. Grilled chicken served with fresh salad in a thick peanut sauce. Sliced roast duck with cashew nuts, lemongrass, coriander, tomatoes, cucumber, chilli, onion, lettuce, fish sauce and lemon juice. Pan fried salmon cutlet pieces mixed with red onions, chilli, coriander, tomatoes, cucumber, fish sauce and lemon juice. Sliced green apple and prawns seasoned with lemon juice, chilli, and coriander. Grilled eggplants with prawns and Thai dressing mixed with herbs. 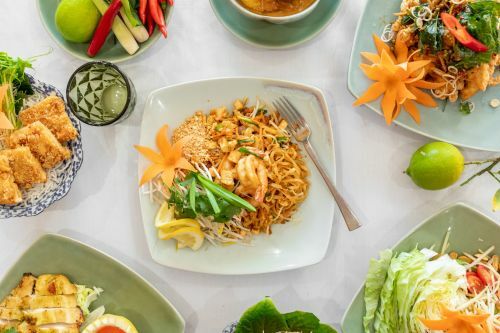 Selection of your choice tossed with Thai salad dressing, fresh herbs and fresh vegetable. Spicy and sour soup with mushroom, lemongrass, galangal, coriander, kaffir lime leaves, chilli, and lemon juice. Light creamy coconut soup with galangal, lemongrass, coriander, kaffir lime leaves, and lemon juice. Pleasantly light tasting chicken piece cooked with vermicelli noodle and vegetables.